Undocumented immigrants started a riot over poor food, medical care and what they say are disrespectful guards at a Mississippi prison. 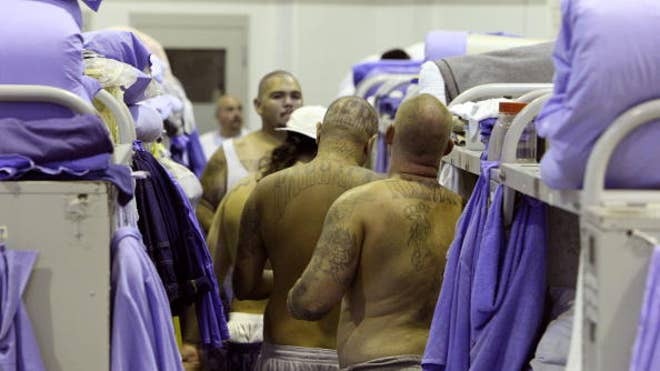 One guard was killed and 20 people were injured in the May 20 riot at the privately-run Adams County Correctional Facility in Natchez, which holds undocumented immigrants convicted of crimes in the United States. The leaders of the Mexican inmates, known as the Paisas, demanded to take a list of grievances to the warden that day and told others in the group to disobey orders from prison staff, according to the FBI affidavit. The affidavit, filed last week in U.S. District Court in Jackson, is part of a complaint charging one of the inmates with rioting. These fatties with their juicy love handles have more cellulite than most 60 year old women and they have the nerve to complain about food and medical care. They need to ship them home and let Mexico foot the bill. I'm sure the food and the treatment they receive will be great there. Last edited by PurpleRain_1; 08-15-2012 at 05:00 PM..
Mexico would just let them go and they'd be back in the USA the day after. Wow - but that's hardly as bad as what I've heard kids around here called. "El Memin Pinguin" if they're a particular race, "anglo", "gringos", even "redneck". Does the slur word "crackers" ring a bell with you? As for the topic at hand if these inmates whether they be illegal immgrants or not aren't getting the proper nourishment I don't blame them for protesting. Oh, and let's not forget the N word I have personally heard used by Mexicans. I have to laugh whenever I hear someone whining about slurs being used against illegals or Mexicans. Pot meet kettle. I agree. Regardless, human beings require nutrients. The fact that they would be lucky to even receive food in Mexico (if they weren't killed on spot) does not relieve us of our obligation to treat people humanely. But, it does boil my blood when I think of the billions we are squandering on illegal aliens. If not for the fact that they would be back within a week, and free to wreak havoc, I would suggest sending them all to Mexico to serve their sentences. At the very least, we need to start billing Mexico and other countries of origin. At this rate, between the costs for the judicial process and incarceration, and other fiscal burdens for the untold millions living in our country illegally, it won't take long before we are completely bankrupt. Yet, the sheeple continue to sleep, and argue over whose campaign is the ugliest. Its always constant demands from illegals in our country. That's what you get for using hard shells on taco day. [Benicar;25662449]Regardless, human beings require nutrients. The fact that they would be lucky to even receive food in Mexico (if they weren't killed on spot) does not relieve us of our obligation to treat people humanely. Hence Obama making commericals for Spanish media that illegals get on the food stamp program. Obviously they aren't eating as well as the taxpayer or our very own homeless citizens. But, it does boil my blood when I think of the billions we are squandering on illegal aliens. If not for the fact that they would be back within a week, and free to wreak havoc, I would suggest sending them all to Mexico to serve their sentences. At the very least, we need to start billing Mexico and other countries of origin. At this rate, between the costs for the judicial process and incarceration, and other fiscal burdens for the untold millions living in our country illegally, it won't take long before we are completely bankrupt. If we shipped them back to Mexico to serve their sentence and paid the Mexican government to house them, it would be cheaper for the US. And if the US allocated $10 a day to feed one prison, Mexican government would spend $3. Then who are the prisoners going to complain to? What's the difference if they serve out their time in Mexico, they will return to the US, the same way after serving their sentence in the US and get deported to Mexico they will be back. Yeah, I was a bit distressed when a white high school aged girl walk past a bunch of Mexicans leaning against a wall with a bottle of Corona in their hand making remarks (cat calls?) and she was called a put@.